Yep, this is finally everything! And July's not even over yet. I shouldn't be so impressed with myself, but I am. My first reaction to finding out there was a Prince of Persia graphic novel was to wonder what kind of bizarre universe I had landed in where it was okay to turn a video game into a graphic novel. Much as I enjoyed the original Nintendo version (yep, I'm old), I don't recall there being an awful lot of...storyline. Nothing complex, anyway. But it turns out, when you hire an actual writer or two, and obtain artistic talent the likes of the fabulous LeUyen Pham as well as her husband Alex Puvilland, you've got a good chance of making something that's an enjoyable story in its own right. Jordan Mechner, who wrote the original video game, worked with A.B. Sina, who is in fact originally from Iran, to write a pretty compelling tale. Featuring two princes separated by time but whose stories echo one another and interweave thematically, it's actually surprisingly complex. Though I found a few of the characters just a teensy-tiny bit hard to tell apart—and therefore I had a little trouble following the story from time to time—overall I loved the artwork, especially the Persian illuminated manuscripts rendered in graphic novel form. If you're at all familiar with works like the Shahnama, you'll know that the artists of this GN took care to be faithful to the art history of the period. I always appreciate that! I received a review copy of this book from the publisher, First Second. 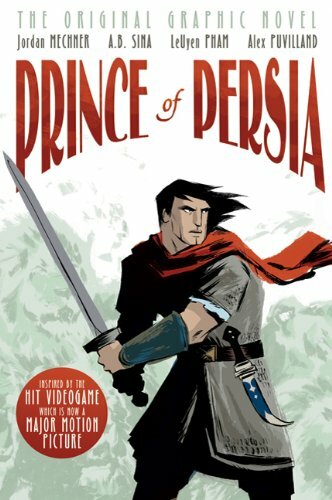 Buy Prince of Persia from an independent bookstore near you! Another Mechner-Pham-Puvilland co-creation is Solomon's Thieves, which is also a swashbuckling sort of tale, this time following a band of Templar Knights who are caught in the middle of their Order's fall from grace. The main character, Martin, manages to escape from the mass arrests and, with a few well-chosen friends, forms a rebel band sworn to save the heritage—and the treasure--of the Knights Templar from the scheming government. The author based his story on research into the history of the real Knights Templar and the period following the Crusades, and includes an interesting bibliography for those interested in reading about it further. A fast-paced and action-packed start to the series. I requested a review copy of this book from the publisher, First Second. 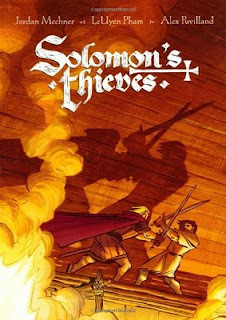 Buy Solomon's Thieves from an independent bookstore near you! Raw, edgy, but still relatable and full of feeling, How I Made It to Eighteen is Tracy White's fictionalized memoir of her time in a mental hospital, and how she learned to cope with her life issues—internal ones (like self-esteem and anxiety) and external ones (like her difficult family). To do so, she must learn to let go of the harmful behaviors that are keeping her from healing, and truly reach out to the ones who are trying to help. The simple, stark monochromatic line artwork is well-suited to the story, and the "problem novel" subject matter is balanced with humor. The arc of the story was a little less defined than I'm used to—it reads more like a slice of life, with a somewhat open-ended conclusion—but that's how real life works, I suppose. It's a solid debut that was clearly cathartic for the author, and whose honesty will hopefully reach others in need and encourage them not to face their problems alone. I requested a review copy of this book from the publisher, Roaring Brook Press. 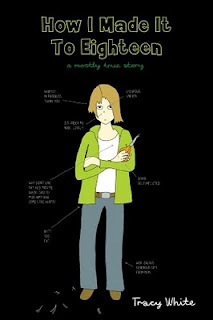 Buy How I Made It to Eighteen from an independent bookstore near you! For some reason, though I like action graphics, I really like the emotional ones -- How I Made it to Eighteen looks like a winner. I'm a single Dad with a 16-year-old daughter. I think I/we should read this. Thanks for the review. Hope you enjoy, Andrew! Thanks for stopping by and leaving a comment. It's HUGE! And Other Stuff. So, how's that e-reader making your poetry look? Dear Teen Vogue: Gay Guys Are Not An Accessory. Check Out Mr. Scalzi's "Big Idea"